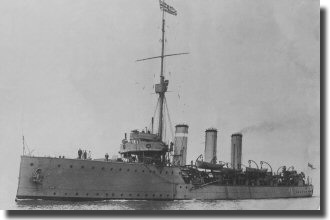 One of the first naval disasters of the Great War was the sinking of HMS Pathfinder off St Abbs Head on the Berwickshire coast in south east Scotland. HMS Pathfinder was a light cruiser and had been built by Cammell Laird at Birkenhead ten years earlier At the beginning of the war she was the leader of the 8th Destroyer flotilla based at Rosyth and on this fateful Saturday she was on routine patrol off the Scottish coast. Many ships were to be sunk during the First World War but HMS Pathfinder was unique inasmuch as she was the first ship ever to be sunk by a torpedo fired from a submarine. The submarine in question was U21 and was captained by Otto Hersing and it was on its third patrol in these waters looking for Royal Navy targets. This time it found one. In his ship’s log, Hersing described what happened. “At around 3 PM in the afternoon, my second in command was on bridge duty and was doing a normal scan of the waters with the periscope. He noticed a British vessel called HMS Pathfinder. At the moment, we were at about 10 meters below surface and in a very vulnerable position. We believe that they noticed us because they turned around in our direction. My second in command immediately called upon me and I answered him speedily. I rushed to the bridge and told the helmsman to submerge. It was a British light cruiser and it seems it was equipped with cannons and machine guns and probably depth charges. When we reached 50 meters, we fired one torpedo and destroyed the vessel. They may well have seen 100 people but in the end there were only 11 survivors from her crew of 267. And all it took was one torpedo. A torpedo that penetrated the ships side, having travelled over a mile to its target and which then caused a boiler to explode. Bits of hot metal pierced the ship’s magazine where the shells were stored and the resultant explosion caused HMS Pathfinder to sink within 4 minutes. Among those killed there were nearly 50 men from London.